Itinerary: O Cebreiro - Triacastela - Samos - Sarria - Portomarín - Vilar de Dornas. Possibility of completing the last kilometres of the Way of St. James before arriving to Santiago on foot. Description: Among the network of Ways leading to Santiago, the most popular and best-known is the French Way, which enters Galicia via O Cebreiro, a town famous for its “pallozas” (thatched-roof houses) and spectacular landscape of old mountains. The rural scenery of inland Galicia accompanying the first section of this excursion has, in some parts, an exuberant and even mystic beauty. After passing the Monastery of Samos, one of Galicia’s important Benedictine monasteries, pilgrims cross the Miño at Portomarín, whose fort-church is one of the best from medieval times. 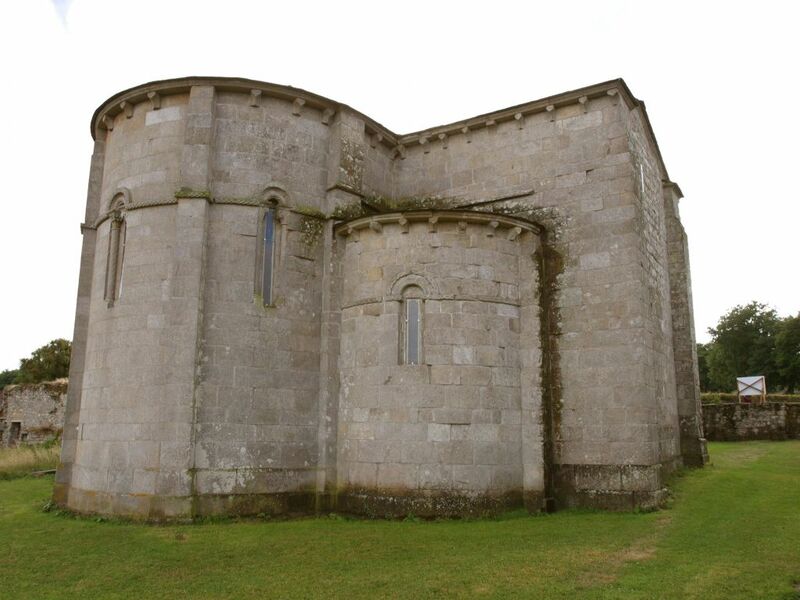 Further on, the Church of Vilar de Donas is one of the best examples of Galicia’s Romanesque style linked to the Way, with frescos dating from 1434. Since in the early years of the ninth century the tomb of Saint James was discovered, innumerable people have come as pilgrims to Compostela. 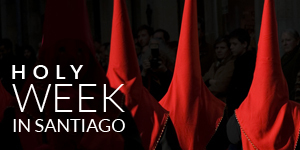 Since very early on the pilgrimage to Santiago became the main religious and cultural event of the Middle Ages, a fact recently acknowledged by the European Parliament, which designated the Road First European Cultural Itinerary, and by UNESCO, which declared it Patrimony of Mankind. 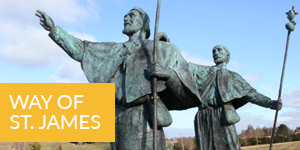 The importance of this centuries-old route of pilgrimage, along which art and thought was diffused throughout Europe, was also reflected in the words of Goethe: “Europe was built upon the pilgrimage to Compostela’. 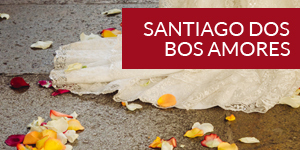 Of all the roads that lead to Santiago, the most traveled and best known is the French road. Its itinerary appears in the Codex Calixtinus, of which book five is the first guide for pilgrims. There O Cebreiro is mentioned, famous for the miracle of the Eucharist and for the chalice appearing on the shield of Galicia. Triacastela, where the pilgrims would collect limestone that they would carry to have it transformed into lime as their contribution to the magnificent construction of the Cathedral of Santiago. After passing the monastery of Samos, today the most important Benedictine monastery in Galicia, they crossed the Miño in Portomarín, of which the church and fortress is among the finest of the entire Middle Ages. They later passed through Vilar de Donas, which belonged to the Knights of Saint James, and then Palas de Rei, Melide, Arzúa, to then reach Lavacolla, where they would carry out their ablutions and prepare their encounter with the Apostle, whose sanctuary they could first see from Monte do Gozo (Mount of Joy), and hence the name. And then at last, Santiago de Compostela itself. The rural landscapes of the Galician interior seen on this trip are in some sections of an exhuberant, even mystical beauty. The village of O Cebreiro, 151 km from Santiago, is the first of the towns on the French road which is on Galician soil. 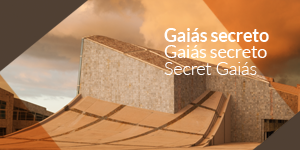 Amid a spectacular mountain landscape, it is one of the most magical, mythical and symbolic places of Galicia. 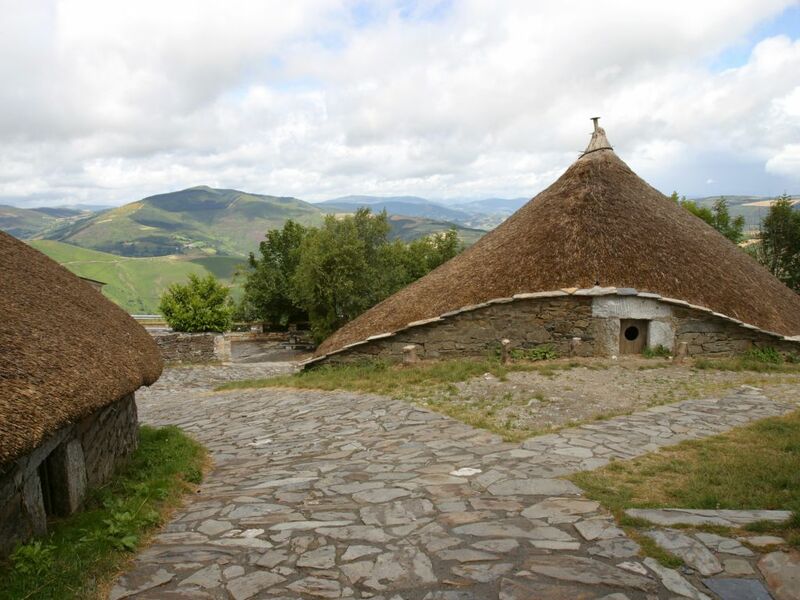 At a height of some 1.300 meters, it is famous for its ‘pallozas’ –small circular pre-Roman dwellings, typical of the northwest of the Iberian Peninsula – magnificently preserved and adapted to the harsh climatic conditions of the highlands. One of these pallozas, has been made into a museum, making it possible to imagine what the living conditions of the local population were like until only a few decades ago. Also indispensable is to visit its very ancient church, the oldest on the whole French road, where there is a beautiful Romanesque chalice which some call the Holy Grail. 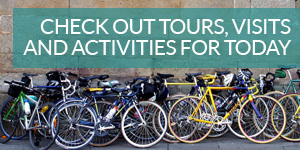 O Cebreiro has also one of the most visited and best loved lodgings for pilgrims on this route. Triacastela keeps an urban structure adapted to suit the road. The name seems to derive from ‘three castros’. There is still a Romanesque apse from the twelfth century in the church of Santiago. Triacastela had a hospital, and even a prison for pilgrims, of which there are a few remains. While the Cathedral of Santiago was being built, some pilgrims would collect small limestones at a quarry in Triacastela, still in use and visible from the road, and took them to the distant lime ovens at Castañeda (Arzúa), to help with the construction of the Compostelan basilica. 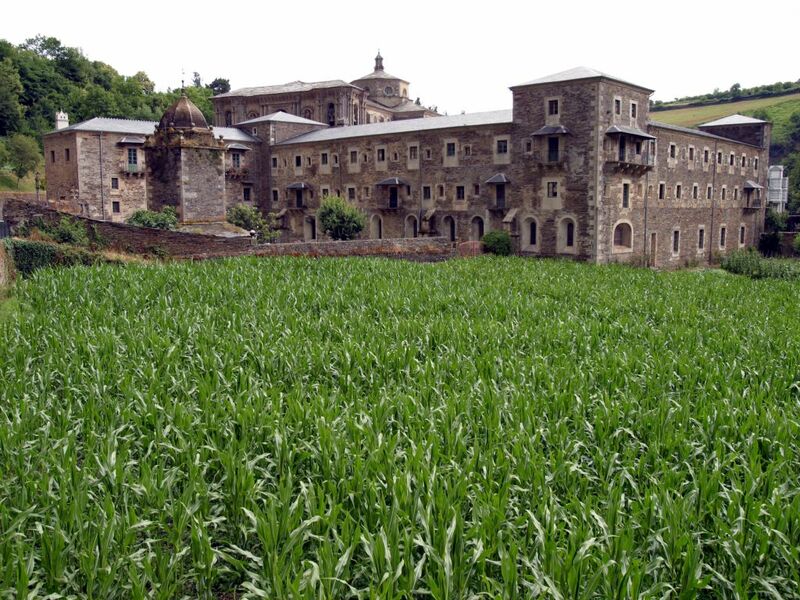 The small town of Samos surrounds the great monastery, in an area of beautiful landscapes crossed by the river Sarria and scattered with examples of typical rural architecture. The Monastery of Samos is considered to be one of the oldest in the western world, since its origins go back to the sixth century. With the adoption of the rule of Saint Benedict, in 960, the monastery offers its hospitality to the pilgrims and in its vicinity builds, around the year 1000, the unique chapel of el Salvador, knownas the ‘Cypress Chapel’ for the great tree of this kind found there, more than a thousand years old. 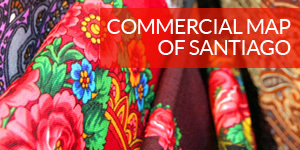 From its past there is an elegant tower and the odd old street still standing, but nowadays Sarria is known for being a Mecca for those interested in antiques, especially furniture. Amid a pleasant and open landscape, the route descends towards the banks of the Miño, where some vineyards can be seen, the origin of the place’s well known aguardiente, similar to grappa. To enter Portomarín it is necessary to cross the bridge over the Belesar reservoir, at the back of which, when the water level allows, the arches of the old bridge over the Miño can be seen, and perhaps also the ruins of the old Portomarín, covered by the water when the reservoir was built. Old Portomarín was made up by the medieval towns of San Pedro and San Nicolás, and used to have one of the best-known Roman-medieval bridges on the route. Its superb church-fortress still stands, which in its day belonged to the Templars. It was saved from being flooded by moving it to its present location stone by stone. An old priory of the Order of Saint James, devoted to the protection and safety of the Road. The old monastery was not on the road itself, for the benefit of quiet and prayer. This is one of the best examples of Galician Romanesque associated with the Road. Inside, there are several tombs of Knights of the Order, but above all, the Gothic frescoes covering a large part of the central apse, painted on occasion of the Compostelan Holy Year of 1434. It seems that this place-name is due to a supposed royal palace built in the area in times immemorial. The church of San Tirso still preserves its Romanesque portico. Palas de Rei belongs to the district of A Ulloa, a land famous for its cheese and made immortal by Emilia Pardo Bazán in her novel ‘Los pazos de Ulloa’. Near Palas is the castle of Pambre (fourteenth century), one of the few medieval fortresses that survived the bitter struggles of the fifteenth century. The Jacobean road crosses cruza this town, built upon a crossroads. Of medieval origin, it still has the Romanesque church of San Pedro, enclosed within the chapel of San Roque, next to which stands one of the oldest cruceiros in Galicia (fourteenth century). The church of Sancti Spiritus (fourteenth century) and the Romanesque temple of Santa María, next to the Ethnographical Museum are other attractions of this town. In the town of Arzúa, famous for its cheese, the rúa do Camiño, the church of Santiago and the chapel of A Magdalena preserve traces of their Jacobean past. A scarce 9 km from Santiago, in the river at Lavacolla was where the pilgrims washed for the last time before reaching the city of the Apostle. At Monte do Gozo, the pilgrims would for the first time see the towers of the longed-for cathedral of Compostela, a joy that has left its mark on the name of this place. 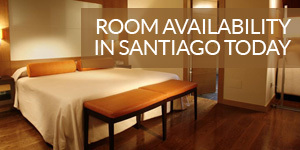 And we finally reach Santiago. We return to the city along the same route endlessly followed by the pilgrims of the past, of the present and of the future, for ever... Be welcome, always, to Compostela.